Tried my first Farmer's Blend after letting them rest for a couple months. Perfect burn for a large ring gauge. Great flavor and huge smoke output. Thanks Paul Bush for an outstanding cigar! These sticks are massive, and a great smoke for a long long evening, Always has a good draw and great taste. WoW! What a fine cigar...just make sure that you have plenty of time to smoke it. This one is slow burning, produces a lot of smoke, burns straight as a laser, and holds the ash forever! WELL DONE! 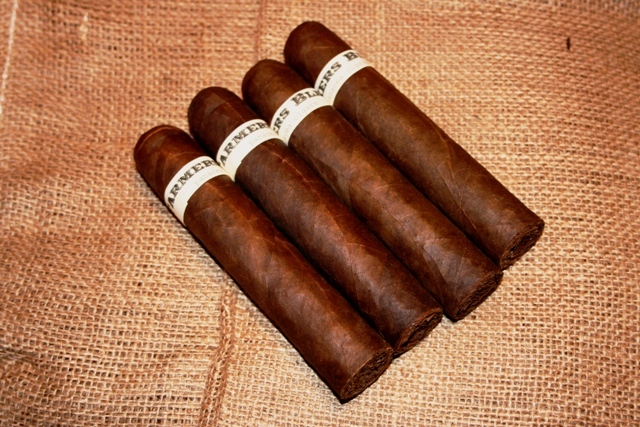 Flatbed Cigars just sent me four PA Broadleaf Toro cigars and added one of their new Farmers Blend (Kentucky Farmers?). As I opened the box, which was ordered on Monday and arrive on Friday having crossed the entire USA, there it was. I put it to my nose and said farewell to my family, grabbed some Merlot and parked myself on my front porch for a smoke. It was VERY good. If you buy from flatbed you will get cigars that you can roll between your fingers and they give a bit without cracking the wrapper, they're fresh. In your mouth for a bit, you can bite without a fear of breaking the wrapper and they conform to you instead of you to them. My experience with cigars is limited but compared to what I find locally, these are the freshest I have found. My personal favorite so far is the green broadleaf because I like them strong and they have that warm milky or creamy sensation as the smoke hits your tongue. Christmas brought gifts from Romeo and Juliet and Arturo Fuentes which may have been good had they been fresh but they cracked and needed humidity. I'll stick to Flatbed for the forsee-able future.